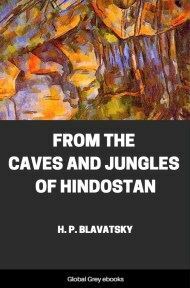 From the Caves and Jungles of Hindustan contains Blavatsky's memories about living in India. 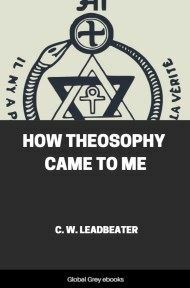 The book is composed of essays written from 1879 to 1886 under the pen name "Radda-Bay". They were first published in Moskovskie vedomosti, a newspaper edited by Mikhail Katkov, and attracted great interest among the readership. Katkov republished them as an attachment to The Russian Messenger along with new letters written specially for this journal. In the book, Blavatsky describes her travels with her Teacher, whom she named Takhur Gulab-Singh. After the tropical nights of the Red Sea and the scorching hot days that had tortured us since Aden, we, people of the distant North, now experienced something strange and unwonted, as if the very fresh soft air had cast its spell over us. There was not a cloud in the sky, thickly strewn with dying stars. Even the moonlight, which till then had covered the sky with its silvery garb, was gradually vanishing; and the brighter grew the rosiness of dawn over the small island that lay before us in the East, the paler in the West grew the scattered rays of the moon that sprinkled with bright flakes of light the dark wake our ship left behind her, as if the glory of the West was bidding good-bye to us, while the light of the East welcomed the newcomers from far-off lands. Brighter and bluer grew the sky, swiftly absorbing the remaining pale stars one after the other, and we felt something touching in the sweet dignity with which the Queen of Night resigned her rights to the powerful usurper. At last, descending lower and lower, she disappeared completely. And suddenly, almost without interval between darkness and light, the red-hot globe, emerging on the opposite side from under the cape, leant his golden chin on the lower rocks of the island and seemed to stop for a while, as if examining us. Then, with one powerful effort, the torch of day rose high over the sea and gloriously proceeded on its path, including in one mighty fiery embrace the blue waters of the bay, the shore and the islands with their rocks and cocoanut forests. His golden rays fell upon a crowd of Parsees, his rightful worshippers, who stood on shore raising their arms towards the mighty "Eye of Ormuzd." The sight was so impressive that everyone on deck became silent for a moment, even a red-nosed old sailor, who was busy quite close to us over the cable, stopped working, and, clearing his throat, nodded at the sun. Moving slowly and cautiously along the charming but treacherous bay, we had plenty of time to admire the picture around us. On the right was a group of islands with Gharipuri or Elephanta, with its ancient temple, at their head. Gharipuri translated means "the town of caves" according to the Orientalists, and "the town of purification" according to the native Sanskrit scholars. This temple, cut out by an unknown hand in the very heart of a rock resembling porphyry, is a true apple of discord amongst the archaeologists, of whom none can as yet fix, even approximately, its antiquity. Elephanta raises high its rocky brow, all overgrown with secular cactus, and right under it, at the foot of the rock, are hollowed out the chief temple and the two lateral ones. 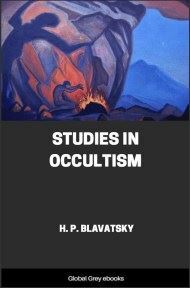 Like the serpent of our Russian fairy tales, it seems to be opening its fierce black mouth to swallow the daring mortal who comes to take possession of the secret mystery of Titan. Its two remaining teeth, dark with time, are formed by two huge pillars t the entrance, sustaining the palate of the monster. How many generations of Hindus, how many races, have knelt in the dust before the Trimurti, your threefold deity, O Elephanta? How many centuries were spent by weak man in digging out in your stone bosom this town of temples and carving your gigantic idols? Who can say? Many years have elapsed since I saw you last, ancient, mysterious temple, and still the same restless thoughts, the same recurrent questions vex me snow as they did then, and still remain unanswered. In a few days we shall see each other again. Once more I shall gaze upon your stern image, upon your three huge granite faces, and shall feel as hopeless as ever of piercing the mystery of your being. This secret fell into safe hands three centuries before ours. It is not in vain that the old Portuguese historian Don Diego de Cuta boasts that "the big square stone fastened over the arch of the pagoda with a distinct inscription, having been torn out and sent as a present to the King Dom Juan III, disappeared mysteriously in the course of time....," and adds, further, "Close to this big pagoda there stood another, and farther on even a third one, the most wonderful of all in beauty, incredible size, and richness of material. All those pagodas and caves have been built by the Kings of Kanada, (?) the most important of whom was Bonazur, and these buildings of Satan our (Portuguese) soldiers attacked with such vehemence that in a few years one stone was not left upon another...." And, worst of all, they left no inscriptions that might have given a clue to so much. Thanks to the fanaticism of Portuguese soldiers, the chronology of the Indian cave temples must remain for ever an enigma to the archaeological world, beginning with the Brah-mans, who say Elephanta is 374,000 years old, and ending with Fergusson, who tries to prove that it was carved only in the twelfth century of our era. Whenever one turns one's eyes to history, there is nothing to be found but hypotheses and darkness. And yet Gharipuri is mentioned in the epic Mahabharata, which was written, according to Colebrooke and Wilson, a good while before the reign of Cyrus. In another ancient legend it is said that the temple of Trimurti was built on Elephanta by the sons of Pandu, who took part in the war between the dynasties of the Sun and the Moon, and, belonging to the latter, were expelled at the end of the war.